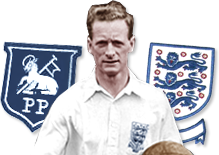 My boyhood hero,had the pleasure of seeing you play at Deepdale at Easter 1956/57 v Sheffield Wednesday & also at Wembley for England. I never saw Sir Tom play football until he retired when I along with over 35,000 turned up for his testimonial. I had of course been told by my father and grandfather how great he was and how he was the best player that had ever played the game. Of course I used to knock on his front door for his autograph and he never turned either me or my friends away.Many parents name their children after their father or someone in the family history. My first son is called Tom after a great footballer and a great man. I was fortunate enough to see Tom Finney many times as a boy at Deepdale including his last game against Luton Town. Words fail...when the ball went to Finney the noise volume of the crowd doubled in anticipation. Right wing for North End, left wing for England and converted to centre forward at the age of 34 to be picked in that position for England with clubmate, Tommy Thompson, alongside him at no. 8. Must just mention World Cup Finals, Sweden, 1958. England v Russia penalty to England. Finney, 36 then, is the England penalty taker. Finney against the legendary Russian goalkeeper, Lev Yashin.Everybody, including Yashin, knew with which foot Finney took his penalties..no problem..Finney steps up, changes feet and scores. Remarkable. I am not old enough to have seen Sir Tom play, however, my mum was, and still is his biggest fan (hello Clare!). Sir Tom wrote me a lovely letter when I got married on the anniversary of his own wedding to his beloved Elsie (1st November). I once saw Sir Tom play in a charity game and was amazed at the way he still had the poise and balance of a young man even though he was years into his retirement. I could only stand round and watch as he ran rings around men half his age - the only problem is that I was one of them! Whilst waiting for my bacon baton in 'Tasty' on Corporation Street, I noticed this poem on the wall. On which t'other buggers had won. On who tha could allus depend. And beat anyone - any two. And stick ba' in t'net to applause. By the heck, they were wick, they could go. As some reckened were good - What a fraud! And bang o'er a few centres, nowt more. Because Stanley weren't able to swap. And they tell thee that Matthews were great. He could on'y be ca'd plumbers mate. I love you Sir Tom. You are forever my inspiration as a sportsman and a person. I wish you could have played football forever so I could have watched you, just once. I was two years old when I had the privilege of kicking a football around with Sir Tom when he collected his children from a neighbour's house after every home game. Little did I know just how blessed I was. Nearly sixty years have since passed and my admiration for him as a footballer and as a man are undiminished to this day. Preston's finest son and a man proud to be a Prestonian. One of the greatest sportsmen to grace the name and the game of football. Makes me truly proud to be a fellow Prestonian.